Inspector blogging: Have you seen what's on the telly? Have you seen what's on the telly? Have you seen our new show on the telly? It is called Devon and Cornwall Cops and is on ITV. It's another factual TV show. I try and avoid them. I accidentally saw the end of an episode this week. To my surprise it was actually quite good and nice easy watching. The show would make me want to join up if I hadn't already done so. However it will probably come as no surprise to you that a certain amount of editing has gone on; and quite right too. I am sure the same is true for Brit Cops War On Crime, Road Knights Specialist Super Heroic Traffic Cops (I may have made that one up) and many more. Most seem to play up the crime and human drama. It seems that is not the case for Devon and Cornwall Cops. So far we have a Neil Morrissey narrated meander through the more enjoyable or amusing aspects of the Job, especially if they happen to be taking place somewhere picturesque. When I asked colleagues what they thought of the show I got mixed reactions. More than one said we had been made to look like tourist guide carrot crunchers with no crimes to investigate or vulnerable people to protect. Now I knew where they were coming from, and had some sympathy, but I happened to genuinely like what I saw of the program. I like it that the good and amusing things about this job get shown on telly. There's plenty of programs out there already broadcasting the nasty work we have to do and the nasty places we have to go. And I have also learnt that the nasty details of our work that get talked about in the car or office, are often better off staying in the car or the office. Especially when people who do not work in our cars and offices say they really want to know what we have been talking about. This was reinforced for me during a Sunday Lunch friends had invited me to, friends I had not seen for some years. A partner of one of my friends was insistent that the police was an easy job and that they wanted to know "but what is it that you actually do?" I told them It wasn't what they had been expecting. I haven't been invited back yet. 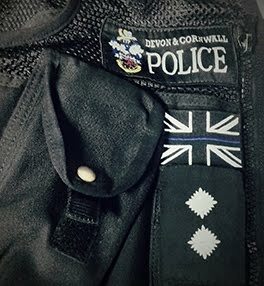 So, have you seen Devon and Cornwall Cops? If you have or are going to then enjoy the scenery and the humour in some of the more ridiculous things we do on behalf of our communities. But do remember there is a lot more happening that isn't being talked about, and probably shouldn't be talked about on prime time telly. PS - Please do drive safely, be kind to each other and don't take stuff that isn't yours.